This weeks episode of the Gatecast takes a look back at Stargate Atlantis and their five year adventure in the Pegasus galaxy. As we did in the SG1 retrospective (mainly to keep the discussion short) we compiled a few questions and then had a round table type chat, it was fun. We did have some recording issues when we lost the primary track so the audio quality is far from perfect but listenable so we hope you enjoy our answers to the various questions, if you have alternatives then feel free to let us know. Our thanks to both Brad and Thomas for joining us for the show, rare we have guests from Australia and America on the same podcast but it worked out ok apart from said recording failure which wasn’t skype’s fault. 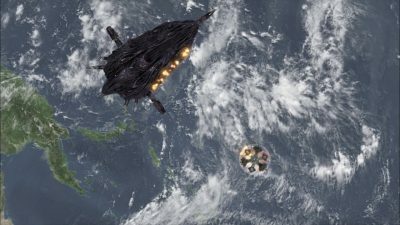 Next week we are back to our Stargate Universe adventure with the episode Malice and are joined by Stephen so not long to go before we have covered all the live action Stargate made so far. 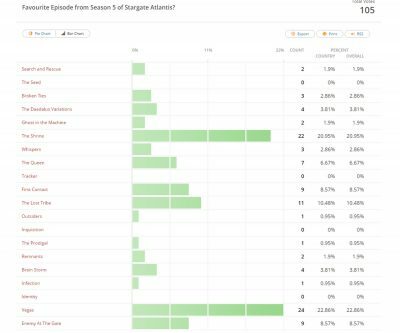 We also want to thank everyone that voted in the Stargate Atlantis Favourite Episode Poll, we ended up with eighty responses and of them there were thirty eight people who left contact information and we’re included in the prize draw. If you want to know if you have won then listen to the show, I’ll be contacting the main winner and runner ups in a day or so to make delivery arrangements. 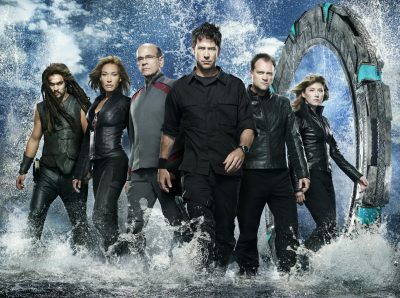 We will be chatting about the Stargate Atlantis series on December the fourth and along with the results of our favourite episode poll we will be covering some simple questions. It will provide a more structured show and with 5 seasons we would end up going all over the place and a show lasting perhaps half a day. We have of course already covered every episode and each season in depth so again specific questions makes more sense. The plan is that Alan, Mike, Brad and Thomas will be on skype recording the show but hopefully we can get some other responses to the questions to be included in the show. If you do want to let your opinion be heard then reply to this post in the comments section or email us directly. 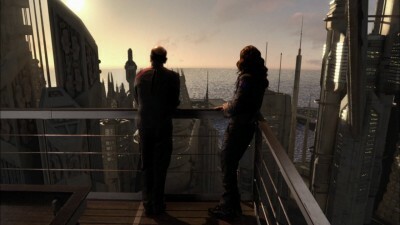 In the fifth and final season of Stargate Atlantis we can honestly say the producers and writers delivered episode after episode of quality science fiction, of course as to be expected one or two of them dipped below the very high standards that were being set but overall this was an excellent season of Stargate Atlantis. In many ways you could argue that it was too good because the loyal viewers who had embraced Woolsey as the commander and enjoyed the changes and growth in the characters this season knew there was so much potential that would remain untapped. Of course opinions abound as to why Atlantis met it’s fate but at the time the DVR and Streaming options had little effect on corporate decision making and live viewing figures were not spectacular and we know cancelling is always the first option for the suits. We couldn’t have done this season without the support of our guests so a big thank you to Thomas, Andrew, Ian, Brad, Jeff, Matthew and Tim for joining us and our thanks to everyone who sent in feedback directly or via our social media. Next week we are going to be taking a look at the Stargate SG1 movie The Ark of Truth and the week after that we’ll take a look at SG1’s Continuum then we begin Stargate Universe, hope you join us for that adventure. The 17th episode of the final season of Stargate Atlantis is “Infection” and deals with some of the ramifications of the retrovirus in one of it’s many forms. A Hive ship is approaching Atlantis and a corrupted message is received from Todd, a jumper rendezvous with the Hive and they find all the Wraith in stasis but with no automate revival time set in the system. Rodney searches the ships database and discovers that the retrovirus/gene therapy had been given to the whole crew but after initial good results something went wrong, drastically wrong. Malfunctions are evident on the Hive and then a scream and a security guard is found dead, well half eaten it seems the Wraith can no longer feed by drawing life force but the infected have still got teeth. They wake Todd who is not too happy given that they are no position to save his crew but as more of the infected get loose and the hive slowly loses integrity being affected by the virus itself they find themselves in a decaying orbit. Rodney is bullied by Todd to perform above and beyond and the Hive or what is left of it crash lands into the ocean where they few survivors are rescued. John who gave his work asks for permission to release Todd and he leaves hoping to find a cure for the virus in an old tradition of bonding with an Iratus Queen. Infection is an episode that exists to tie together some plot points and to make the most of Todd (Christopher Heyerdahl) and to be fair it does a decent job with the atmospheric horror leaning story. The production side provides some great CGI visuals as the hive breaks apart and the standing set never looked better but money must have been tight when the crash was created, that looked bad. However you never get a bad episode when Todd is front and center and once again he shows why this character became a fan and production favourite. We didn’t have a guest this week as it was a spur of the moment recording and well outside of the planned schedule but we had fun. This weeks promo is for Treks In Scifi and next week we are taking a look at the eighteenth episode of the final season “Identity” so hope you join us and let us know what you think. In Brain Storm Rodney is invited to a presentation by a former colleague, he asks Jennifer to accompany him and perhaps a little to his surprise she is quite pleased to do so. The presentation takes place in a facility in the middle of nowhere with tight security where Dr. Malcolm Tunney reveals his matter bridge a device intended to funnel heat from the Earth to another universe/reality thus reducing global warming. Rodney recognizes the device as being the same technology he used to access the alternate realm which brought his other self to Atlantis but when he speaks he is ridiculed as it seems Rodney has a bit of a reputation amongst his peers. However as Rodney suspected once the device is activated and working it can not be turned off as it’s providing it’s own energy and as more heat is drawn from the facility the colder it gets resulting in a new phenomenon imaginatively called “freeze lightning”. Jennifer attempts to contact the SGC after they find a weak area in the containment field but she is then trapped in a corridor flooded with water, Rodney desperate to get to her pulls the proverbial rabbit out of the hat and leaves the control room to save her. Tunney using Rodney’s code shuts down the matter bridge and in the nick of time Rodney is able to revive Jennifer, not a bad official first date it would seem based on the events that occurred on the plane flying them home. Brain Storm is a very very good episode, we finally get to see Rodney asking Jennifer out and as we knew she had serious feelings for him it’s no surprise that she says yes, Rodney was surprised which made the whole scene just that more enjoyable. We also learn that Rodney really did make himself a bit of a loner within his peer group, his reputation is not good and that fact working with the SGC and IOA means no published papers just underlines the disdain many feel for him. Of course the fact that Bill Nye and Neil deGrasse Tyson are two of his peers kinda raises the whole episode to a whole new level and huge thanks must go to the two men who were more than willing to poke fun at themselves. 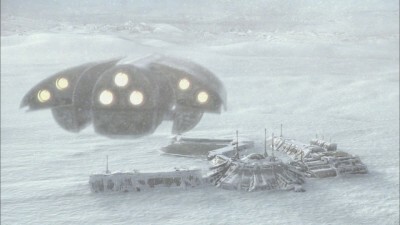 In Remnants an alien device is found on the ocean floor near Atlantis thanks to an inspired idea from Zelenka. It is brought on board (yeah that makes a lot of sense) and it turns out to be some sort of storage device for a race long gone from these here parts. For reasons that become clear as the episode progresses certain personnel of Atlantis have a very interesting day as they experience events a little out of the ordinary which would normally be par for the course. Complications arise as Shen Xiaoyi the IOA representative is visiting with the intent to replace Woolsey as commander of Atlantis perhaps with her own agenda or maybe not. This weeks promo was for The Dune Saga Podcast a podcast that takes a look at the classic Dune novels and their evolution in all media. Thanks to Ian for joining us for Remnants and he had to put up with a lot of technical issues but he will be returning in a few weeks. 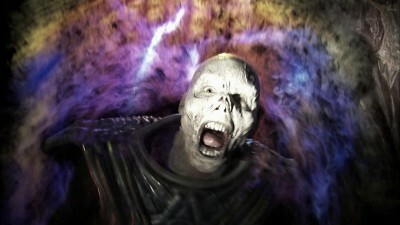 Next week we are going to be taking a look at the excellent episode Brainstorm and that will be a lot of fun I’m sure. In The Prodigal we have John and Rodney having fun with their remote control cars only to be surprised by Teyla who is having a stroll around the city and trying to get her son to settle down. As they chat the power goes throughout the city yet there seems to be lights in the main control room. What John and company don’t know at that time is that a jumper has returned via the codes of one of the teams off world and then proceeded to stun everyone and then Michael and his hybrids emerge from the jumper. Teyla has returned to her quarters only to be captured and taken to Michael who as ever is intent on developing even more useful hybrids and is desperate to get Torren’s DNA and if Teyla comes along that all is peachy. 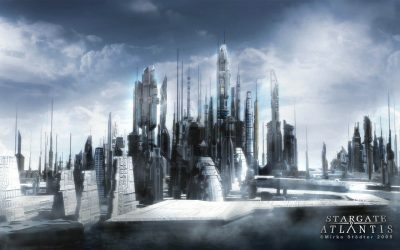 Michael’s plan seemed sound but since the stun field left most of the cities personnel intact they soon begin to test the boundaries of the shield in an effort to counter attack. It becomes apparent that with the jumper supplying energy direct to the shield there will be no easy way to by pass it but Rodney is tasked to fix one of the jumpers in the underground bay and an unorthodox method of attack is devised. Thanks to Brad for joining us for this weeks episode and he’ll be back before we move onto Stargate Universe, speaking of which the episodes are being assigned so check the schedule and get your name down for a guest spot, we’d love to have you. If guesting on the podcast is not your thing than by all means we’d love to hear from you about Stargate and our discussions of the episode so don’t be shy. This weeks promo is for The Batcave Podcast and next week we are taking a look at Remnants with Ian. Inquisition and lets be honest no one ever expects the inquisition is sprung on the members of the main gate team after an invitation to a meeting with representatives of some alien worlds. These worlds are joining together to make decisions in terms of the Wraith and future of the Pegasus galaxy or so they claim. 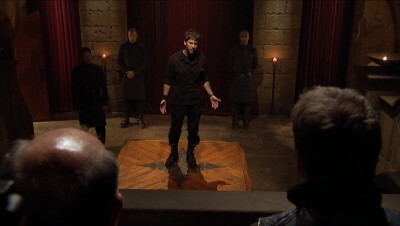 As it turned out this was a trap designed to capture Atlantis personnel and then to have them stand in front of a tribunal or inquisition to answer for their crimes. The three members of the bench proceeded to question every significant event that has taken place since Atlantis was reborn and while they had many good points the information they had was provided with an inbuilt bias. These along with other personal concerns pretty much guarantee a guilty verdict and so it is up to Woolsey to save the day since he recognized the power play and manipulation going on, after all he excelled in the politics of bureaucracy. Inquisition pretty much takes place in three locations, the briefing room, the jail cell and the court room and no doubt even with solid guest actors this episode was designed to be a money saver. That said Stargate has always done the clip show format with some style by making sure the story that provides the reasoning for the clips to stand by itself and once again Inquisition benefits from the level of attention. A very good episode for Woolsey it has to be said as well as the guest stars who had to carry the story with the regular cast pretty much going through the motions. 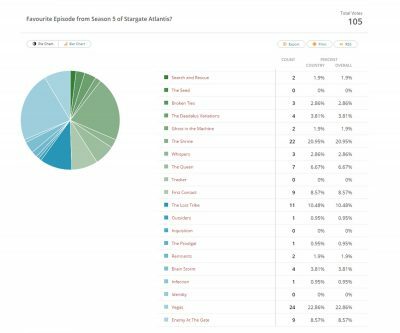 Overall not a great episode but certainly worth watching because most of the charges against Atlantis have been brought up by fans during the shows run and long after, I know we’ve talked about the culpability of the Atlanteans in the events over the last few years.